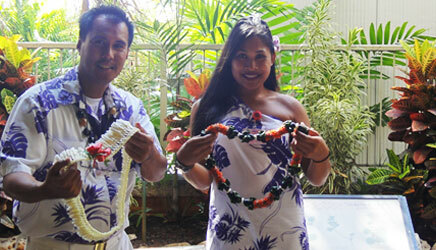 Experience a traditional welcome to the Islands with a Hawaiian flower lei greeting at the airport! A lei greeting is a warm and wonderful way to begin a Hawaiian vacation and experience the aloha spirit. Your friendly lei greeter will wait for you at your arrival gate at the airport and welcome you with a fresh flower lei. Reserve a Hawaiian lei greeting for yourself, or make a special gift for someone else. This is also a great gift idea for honeymooners or first-time visitors to Hawaii. Reserve your Hawaiian lei greeting through Hawaii Discount. We offer the lowest prices on all lei greetings in Hawaii. If you want fresh flower lei greetings, then make sure you order from us. All our leis are fresh and are NOT associated with a transportation company. All we do is offer the best fresh flower lei greetings and do not combo them with a transportation company. Greeter will wait for you inside baggage claim at the Honolulu airport wearing a sand/black uniform, with a welcome sign with your name or group name. You will see your Greeter as you exit the terminal, prior to baggage claim. They will be wearing a purple/white uniform and welcome sign personalized with your name or group name. A flower lei greeting at the airport is a great way to start your Hawaii vacation. Have one of our Hawaii airport greeters meet you with a beautiful Hawaiian lei. Order your Hawaiian lei greeting today.